Wakeboard, Monoski, Tubing… Choose your toy and glide on the most beautiful lagoon of the world! Sport and fun guaranteed! Accessible to beginners and advanced practitionners, the different activities are supervised by a qualified instructor. Enjoy your first kite surf lesson or perfect your technique on Bora Bora large turquoise lagoon. 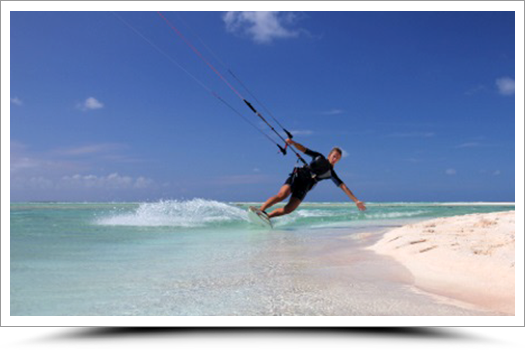 Pick-up by boat and transfer to the best kite surf spots in Bora Bora. Glide, fly and have fun…no noise or pollution will disturb your session! Operates everyday, 6 persons max per boat including accompanying persons; (Adults or Children 12 years old and over). Make yourself comfortable onboard this traditional sailing canoe’s netting and enjoy the beautiful colors of the lagoon gently passing beneath and around you as you make your way to Motu Piti A’au where lunch will be served. What can beat a traditional Tahitian lunch as you sit in the lagoon with your feet in the warm tropical waters. Unwind sun bathing or walking on the beach before sailing back to your hotel. 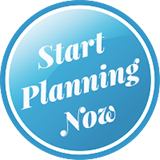 Shorter sailing tours are also available – please inquire. 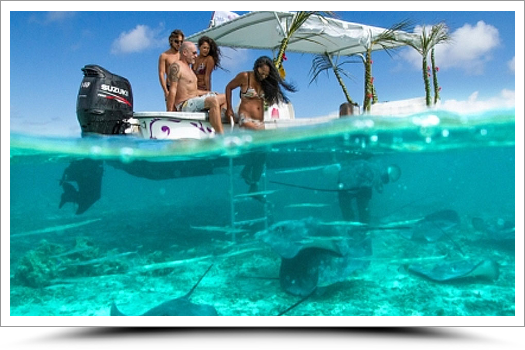 This is the ideal combination of a photo shooting and a discovery tour on the turquoise lagoon of Bora Bora. The day begins in the morning with a photo shooting at your resort followed in the afternoon by a lagoon tour including additional pictures on the water and during the snorkeling stop. You will keep 200 professional-quality pictures of this unforgettable day. 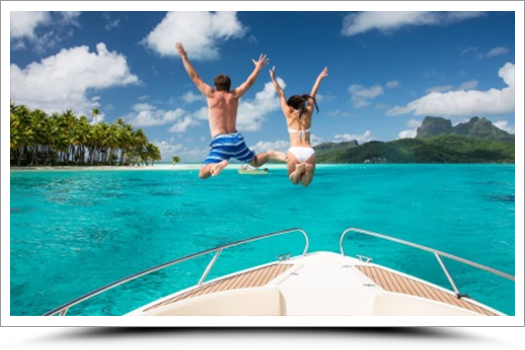 As a couple or family, board a high-end boat, discover the lagoon of Bora Bora and keep as souvenirs some beautiful pictures of your escapade. Complimentary half bottle of champagne per couple at the end of the tour. Retouched quality photos of you on the lagoon, in the water and even under water during a snorkeling at the coral garden. 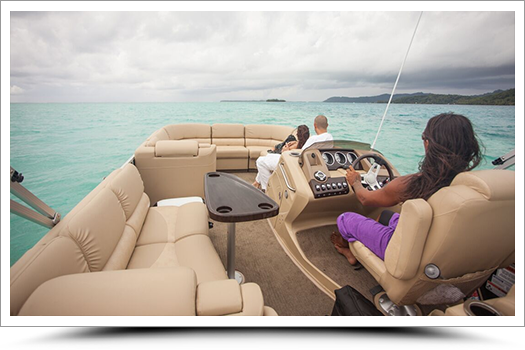 Onboard your exclusive luxury boat, your guide Tanoa will take you around the island for a full day of lagoon discovery. Snorkeling at the manta rays spot, coral garden, aquarium, shark and ray feeding before stopping on a motu. There, your guide will show the traditional way to climb to a coconut tree to get a coconut, how to open it and more…The table is set-up in the lagoon or on the beach to savour a delicious surf & turf lunch accompanied with Champagne! Champagne are included…sit back, relax and enjoy the magical moment. Some say that Mother Nature gave the Pacific Ocean the gift of a heart, which hid it in the waters of Polynesia, under the protection of Mount Otemanu. Inaccessible by sea, this untamed beauty called Tupai only reveals its secret to visitors arriving from the air. Departing from your hotel on Bora Bora, fly over the little deserted open heart-shaped atoll and admire the purity of its colours, before landing on one of its fine sand beaches. After a short photo session to capture forever this exclusive and intimate moment, enjoy a bottle of chilled Champagne, the feet in the pure lagoon, or in the shade of a coconut tree…30 photos on CD included. If you’re no water baby but you want to explore Bora Bora’s submarine flora and fauna then this is perfect for you! You can observe the coral gardens, sharks and rays through the boat’s glass bottom and the multi-coloured fish attracted to the boat will come to take a look at you too! This trip is made all the better with its superb scenic surroundings and the lagoon’s unique setting which you can admire from the comfort of this covered pirogue. 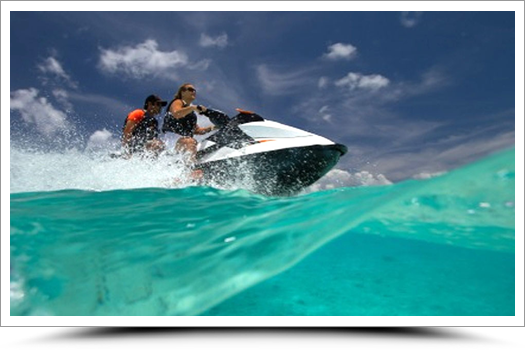 Do not hesitate between jet ski and quad by booking this combo tour 2 in 1! 2 ways to discover the beautiful island of Bora Bora! 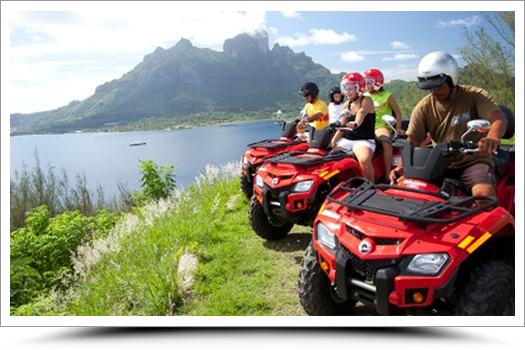 Drive around Bora Bora on your automatic ATV last generation up to 2 view points that will leave you unforgettable souvenirs. You will taste some fresh local fruits while enjoying the colors and landscapes of Bora Bora. 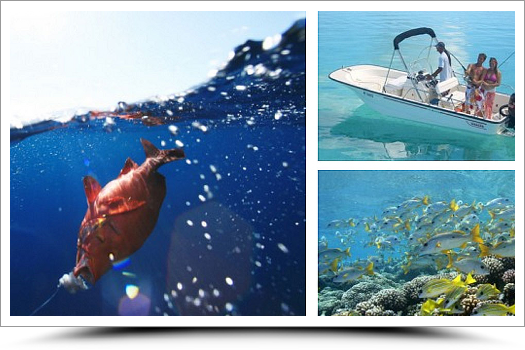 This is the best way to explore marine flora and fauna on a trip for swimmers of all levels. Your qualified diving instructor will instruct you and help you explore the beauty of the coral gardens, leopard and manta rays during visits of protected sites on board one of the most comfortable boats. Explore Bora Bora’s marine life on board a comfortable boat and swim amongst the colourful fish, blacknose sharks and stingrays in their natural habitat in the coral gardens or their favourite place in the Bora Bora lagoon. 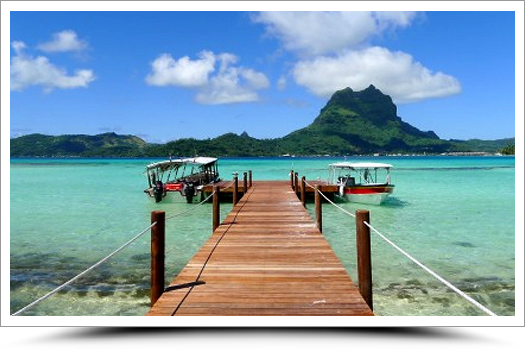 A good combination of adventure tours to discover both the mountainside and lagoon of Bora Bora. Begin with a 4WD tour going to breathtaking viewpoint through paths that only a 4WD can reach. 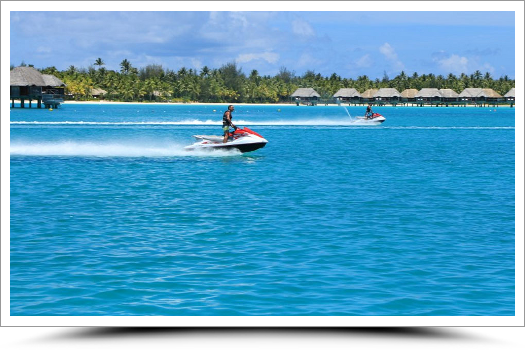 After lunch, continue the day with a jet ski tour allying sport and fun on Bora Bora clear lagoon including a stop on a motu to relax and enjoy a refreshment. A full day on the lagoon combining sport and discovery. Begin the day with a 2-hour jet ski tour, have fun driving on the beautiful lagoon of Bora Bora before stopping on a motu. Then return to the main island to have lunch in the typical decor of famous restaurant the Bloody Mary’s. The day continues with an underwater discovery with the shark & ray watching and snorkeling in the coral garden. 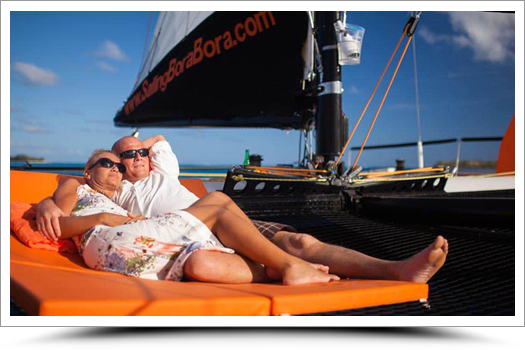 The perfect program to have fun discovering the treasures of Bora Bora lagoon. Get up close and personal with the lagoon’s glittering gems from the comfort of the Bayliner’s bow on this spellbinding and original trip around Bora Bora. 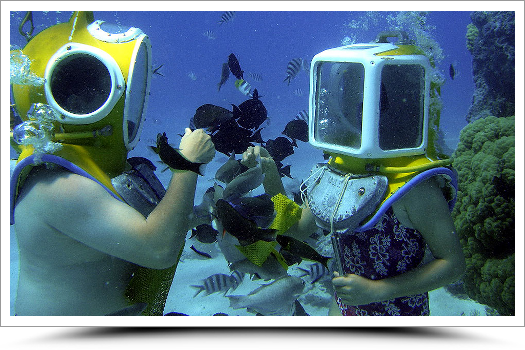 Go snorkelling in the coral garden and the turquoise lagoon then learn about the island’s history and how it was formed. Your guide takes professional photos so you can take the magic home with you. 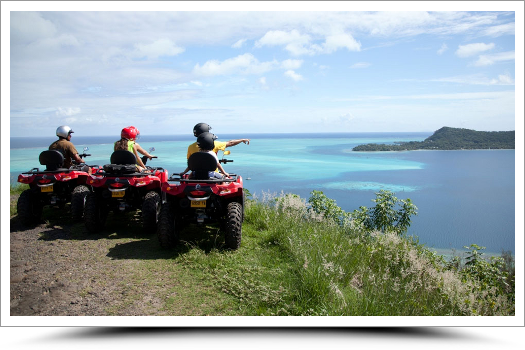 Get in a 4WD vehicle to discover the wild interior of Bora Bora, its WW2 remains not forgetting the spectacular panoramic views over the lagoon’s blue shadings. Fun and friendly, in addition to the main sites of the island, the Tupuna tour brings you to the pareo workshop where patterns are hand painted on fabrics with a paintbrush, a technique allowing to create a large variety of beautiful designs. Also sample fresh season fruits and discover the unique pearl farm of the island. A unique & totally eco friendly way to experience the most beautiful lagoon in the world. Vitamin Sea is a very spacious racing sailing catamaran turned into a comfortable cruising catamaran with its sunbeds and sound system. Its large nets offer you great views of the amazing water flowing underneath you. It is the only catamaran capable of sailing in the shallow waters and taking you to the most beautiful spots in the lagoon. During this smooth yet exciting sailing adventure, relax on the sunbeds, enjoy the scenery, the background music & the professional service of your Vitamin Sea team. 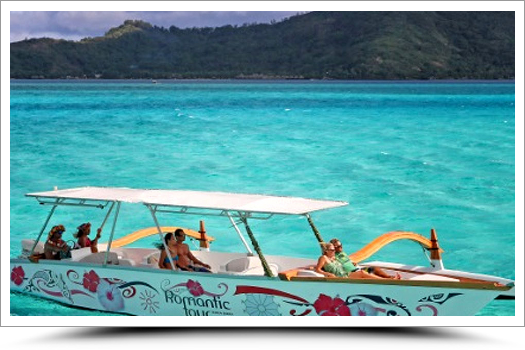 Go on a romantic trip on board the private and plush Bayliner on Bora Bora’s lagoon. Your guide will take professional photos at the most beautiful locations as you admire Bora Bora’s beautiful scenery or underwater as you go snorkelling amongst submarine treasures. End your trip with “coco-Champagne” on the lagoon before heading home with your unique souvenirs. 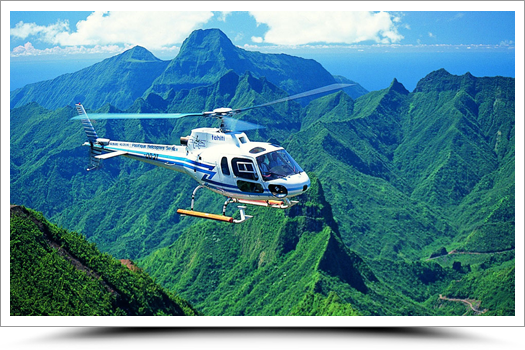 Experience the thrill of flightseeing over the Pearl of the Pacific. Just memorable! 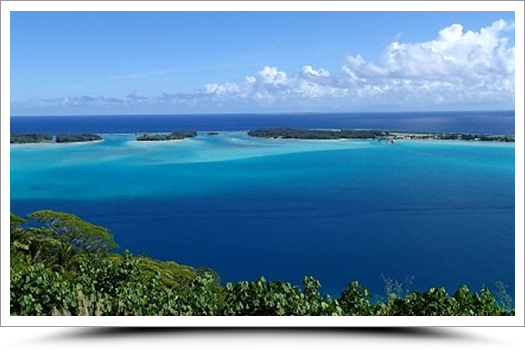 Combine the translucent lagoon of Bora Bora with the heart of Tupaï by passing through the bays of Tahaa and round off your flight with the most sacred and mystic of the islands, Raiatea. It is the excursion par excellence not to be missed! 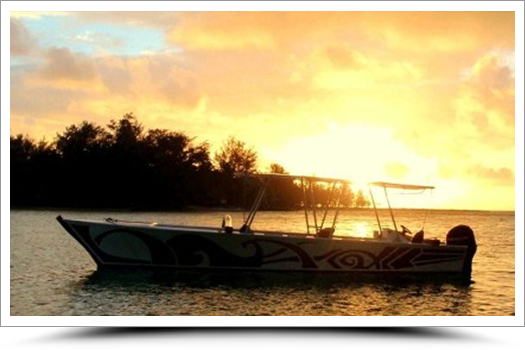 Leave Bora Bora onboard the Luna Sea, a Black Watch 34 fishing vessel adapted to our Polynesian waters to reach Tahaa the “Vanilla Island”. 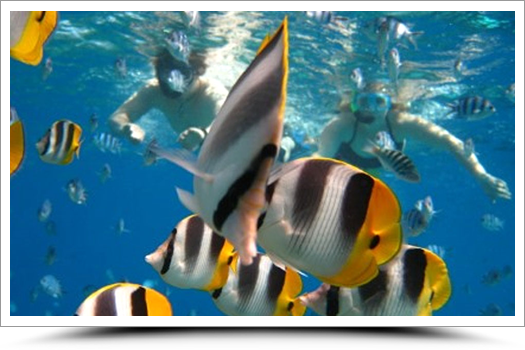 Choose between 4WD island tour, snorkeling, scuba diving to complete the deep sea fishing activity. Includes: soft drinks, beer, 2 crew members, deep sea fishing on the way back to Bora Bora if interested. Additional activities and lunch at extra cost to be paid on spot. Set off on board Luna Sea, a Black Watch 34 fishing vessel adapted to our Polynesian waters. Our tropical climate and Luna Sea’s modern equipment make for ideal fishing conditions. Maybe you will catch a mahi mahi, red tuna or even a marlin! Your evening on the motu begins with a cocktail drink at sunset served on the beach. As night falls and the stars come out, you will be served a delicious dinner on a beautifully decorated table lit by torch light. Menu based on local fish dishes. 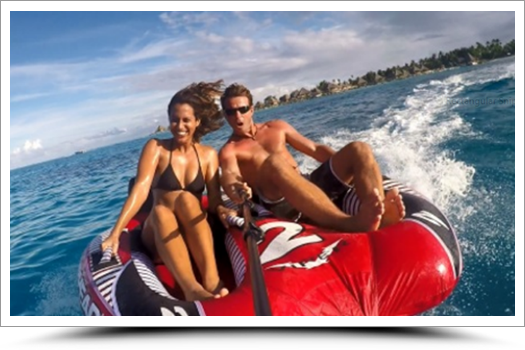 The perfect romantic evening begining by a romantic sunset cruise onboard a nice motorized outrigger boat specially designed with several small private benches offering comfort and intimacy. 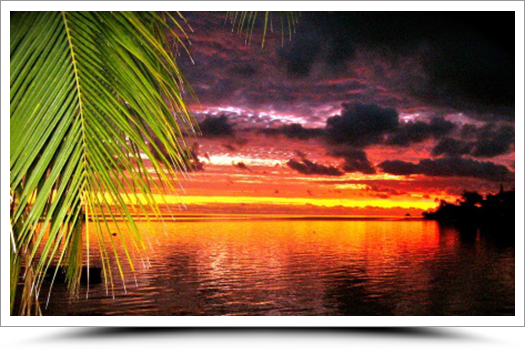 Enjoy the sunset at the sound of the ukulele before reaching the pontoon of restaurant St James in Vaitape. Welcomed with a glass of Champagne, savor a 3-course romantic dinner prepared by the Chef. This is a great day with a full day on the lagoon combining sport and discovery. 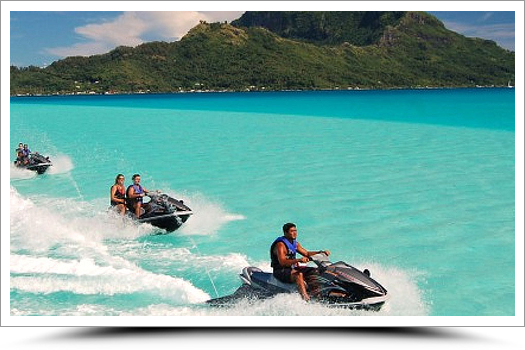 Begin the day with a 2-hour jet ski tour, have fun driving on the beautiful lagoon of Bora Bora before stopping on a motu. Then return to the main island to have lunch in the typical decor of famous restaurant the Bloody Mary’s. Enjoy lunch with your feet in the sand and browsing the names of all the famous stars who have had their toes in the sand enjoying a Bloody Mary’s meal. Then the day continues with an underwater discovery with the shark & ray watching and snorkelling in the coral garden. The perfect program to have fun discovering the treasures of Bora Bora lagoon. 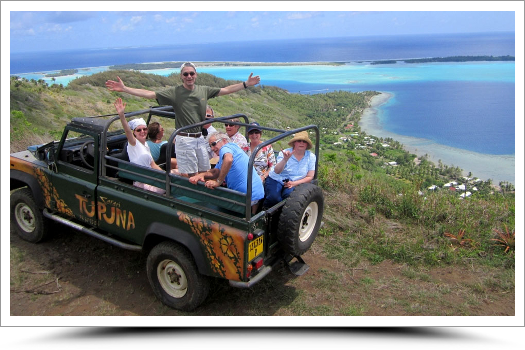 Jump on board a 4×4 and explore the wild side of the Bora Bora mountains. Enjoy the spectacular panoramic views of the lagoon from different viewpoints. Learn all about the area’s flora and fauna, local customs and Bora Bora’s culture and history from your expert guides. On the tour you will discover the interior of Bora Bora’s savage mountains, the sacred temples and the American remains from World War II. Experience some of the most spectacular scenery of the emerald lagoon. Taste some tropical fruits and learn about the Polynesian culture from native guides, famous for their knowledge and their sense of humour. 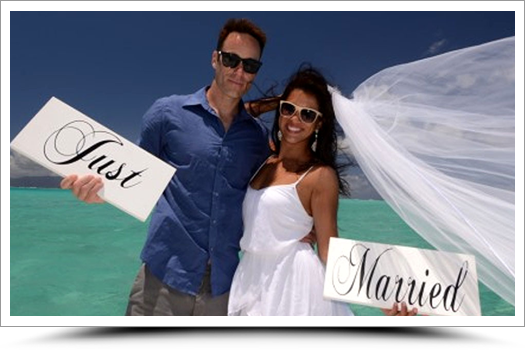 You will also enjoy a to the only pearl farm of Bora Bora and learn the secret of the Polynesian Black Pearl. From the oyster farming to the grafting, from the harvesting to the pearl classification, from the conception to the realization of an artistic jewellery, you will learn everything about the world of the Black Pearls and the men who give them life. Carl’s Tip: This is a great night to plan on going out for dinner. Make dinner reservations and the guide can drop you off for a night out before you return to your resort. 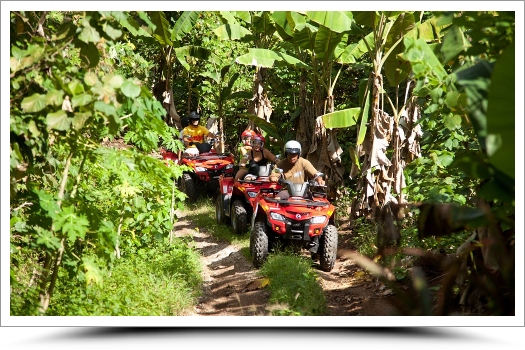 Drive around Bora Bora on your automatic ATV up to 2 different viewpoints that will leave you unforgettable memories. You will taste some fresh local fruits while enjoying the colours and landscapes of Bora Bora. The tour departs from the base at Matira and begins with a familiarization of the equipment on the road before reaching the first climb. Povai Hill – Along the first ascent of Povai hill, you will see some old bunkers left over from World War II. The arrival at the summit will offer a commanding view of part of the island from East to West. 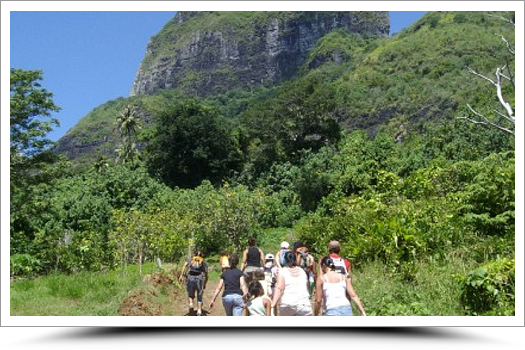 The second climb, slightly more technical, will lead you to a magnificent view of Motu Toopua which is facing Vaitape, the neighbouring islands of Raiatea & Tahaa and mountains Otemanu & Povai. You then return to the base travelling along Rofau bay. Small family business native of the island, the Tepeva family will take you onboard one of its boats on exceptional preserved sites they discovered themselves, away from the bustle of the famous touristic spots. Ray, shark, octopus, lagoon fish, reef… it’s in a friendly atmosphere that the son or dad Tepeva will share its knowledge. To finish in style, discover one of the most beautiful motu of the Bora Bora, the mythical Motu Tapu, former residence of the queen and property prohibited to any person outside the court, hence its name of “tapu” (banned in Tahitian). 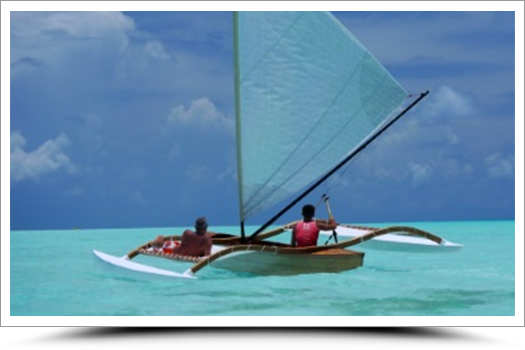 Embark on a comfortable motorized outrigger canoe that will take you to the coral garden to meet the colourful tropical fishes, swim among the stingrays and observe the black tip sharks up close in their natural environment. 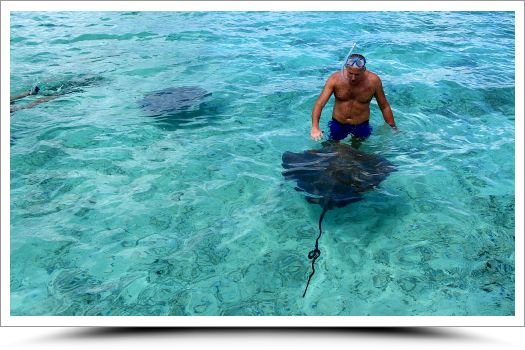 The friendly stingrays are looking for caresses…swim with them in shallow water and if you have an underwater camera prepare for some great photo opportunities. 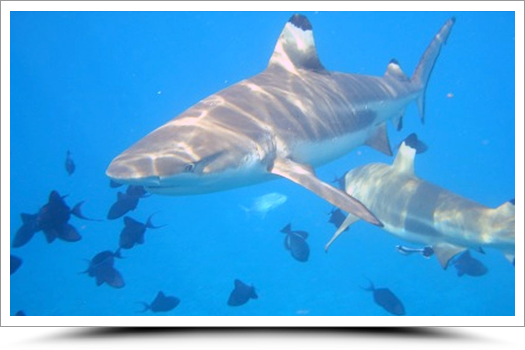 Enjoy a thrilling encounter with black tip shares too either in the lagoon or depending on the sea conditions, outside the reef in the ocean. You will then travel across the beautiful Bora Bora Lagoon to a private motu where a delightful Tahitian lunch will be served to the sounds of a ukulele. Enjoy the afternoon at leisure on the private white sand motu. 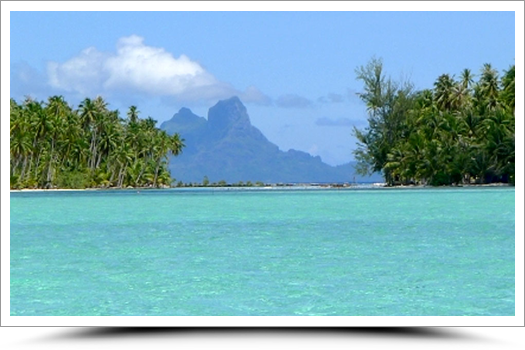 Discover the lagoon of Bora Bora with this full day tour. You will stop in the most beautiful sites the island offers. 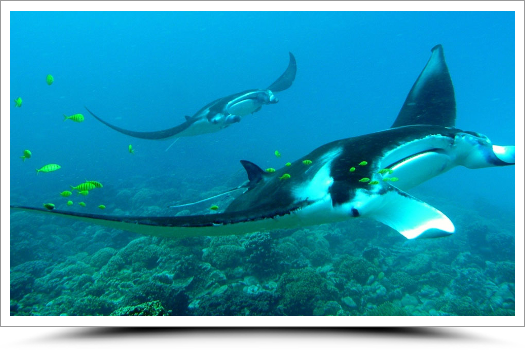 You will have the opportunity to feed rays, watch sharks, swim in a coral garden. Enjoy the rich and diverse marine life of these crystalline waters! Your morning will end with a fresh fruit juice on a small islet with an amazing panoramic view at 360°. For lunch, a Polynesian BBQ will be served with mix grill, raw fish, salads etc. And while you appreciate your meal, your guides will do coco and ‘pareu’ shows. The afternoon will be spent relaxing on the islet with a walk on the beach or a swim in the lagoon. This is the best way to explore marine flora and fauna on a trip for swimmers of all levels. Your qualified diving instructor will instruct you and help you explore the beauty of the coral gardens, leopard and manta rays during 4 visits to protected sites on board one of the most comfortable boats on the waters. The Aquarium: Swim in a natural pool of crystal clear water and be surrounded by hundreds of tropical fish and even stingrays. The Coral Garden: a real bed of corals in shallow water hiding an underwater fauna & flora untouched and full of colours. You might even spot a moray eel pointing the tip of his nose. The Manta Rays: THE highlight of the tour. Along a wall of lace corals, follow the most impressive & peaceful rays that can reach 4 meters wide. The Eagle Rays: meet through a drift snorkelling these amazing animals dressed in their dark dress mottled. Timid, they are always gathered by dozens. The private motu, Lagoonarium, houses 3 fish parks where you can see big fish, turtles, rays and sharks…Enjoy your morning at the motu and its beach before heading back to your hotel for lunch. Located in a totally natural environment, the Lagoonarium offers you the opportunity to swim in three separate enclosed pools. 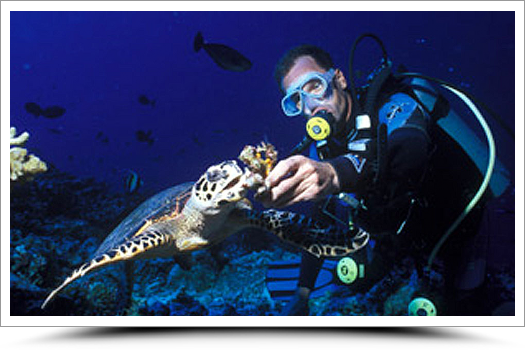 Enjoy these encounters with the local marine life (sharks, rays, jackfish, turtles, parrot-fish). The guides will show you how to approach these animals carefully. You will have the possibility to give them some food and interact with them in a very rare experience and allow you some fantastic photo opportunities. Discover the fabulous underwater world without even getting your head wet! Equipped with a wetsuit and a diving helmet, go for an unforgettable experience: walking in Bora Bora’s spectacular lagoon, which some say is the most beautiful in the world. No diving experience is required, and you don’t even need to know how to swim to discover this exciting new world. Your head remains dry inside the helmet and you get fresh air from the boat via an air-hose. You will be surrounded by colourful coral and tropical fish coming to eat from your hand! The diving site will be reached by boat. A certified diving instructor will then help you put on the helmet and go down the ladder into the crystal waters for a unique 30-40 minutes of underwater exploration. Walk among coral formations surrounded by a myriad of multicolor tropical fish. At the end of your tour, refreshments will be served onboard. With a rich abundance of marine life, colourful corals, incredibly clear and warm waters, diving in Bora Bora is sure to be one of your best dive experiences. There are a variety of dive packages available from those who are experienced divers to intro dives for those of you who have never had a tank on your back before. The marine life awaits and is something that you don’t want to miss! 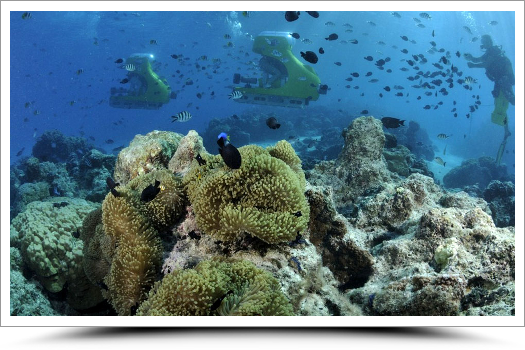 If you are an avid diver, multi-dive packages are available including packages that allow you dive on multiple islands as well so you can travel around Tahiti and her islands exploring all different lagoons and dive experiences. Set off on an adventure in the Bora Bora lagoon on an underwater scooter and explore unknown depths through the secure clear base. The scooter has constant air supply so you can breathe easy and captain this easy-to-use underwater scooter that can go up to 3 metres deep. You don’t need to be a swimmer or diver to enjoy this trip: just hop on and scoot down very safe and easy to drive, you will keep your head dry inside a transparent glass airlock; you can breathe freely with a constant air flow. Enjoy the wonders of the Bora Bora lagoon on your own for 30 minutes at a depth of up to 3 metres (10 feet). After ridding the sub-scooter, a stop will be done where you will be able to swim with your mask & snorkel. On the way back, your captain will explain some information about geology, the myths, and the life of the Polynesians. 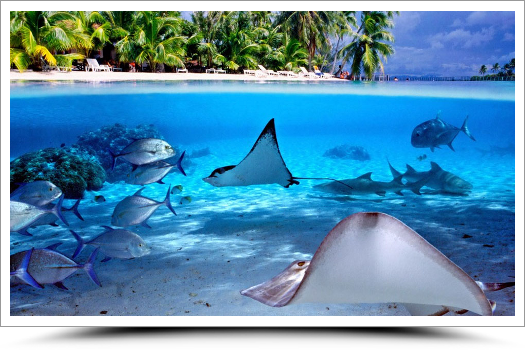 On your honeymoon trip, with friends or family, discover the richness of Bora Bora’s lagoon. During this 6 hour lagoon boat tour, enjoy the aquatic show of the local submarine fauna made of tropical fish, stingrays and black tip sharks. The translucent blue lagoon and the vivid colors of the corals will be your morning theatre. 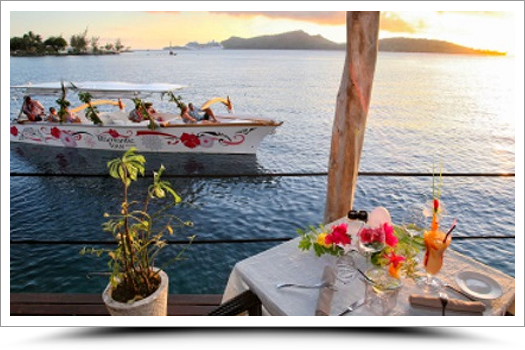 Your BBQ Polynesian lunch will be held on an islet comfortably seated with a breathtaking views of Mount Otemanu. The afternoon will be spent relaxing and enjoying the scenery before returning to your hotel. Picnic lunch: Welcome cocktail once arrived on the islet where a Polynesian BBQ lunch will then be served. On the menu: Tahitian raw fish with salad, grilled chicken, beef and fish, side dishes, local fresh fruits for deserts. Included: soft drinks and water. Fly over the lagoon of Bora Bora for a thrill! 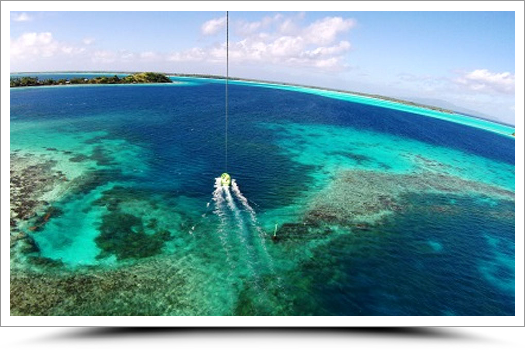 You will discover the lagoon in a different light admiring the rays, sharks from the sky as well as the neighbor islands of Raiatea and Tahaa. 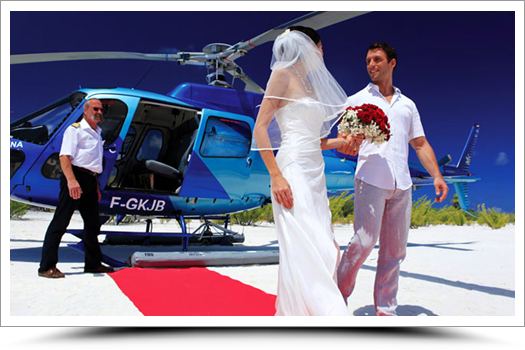 The flight uses a 100 or 300 meters long rope to enjoy the best overview. With this Sunset Dream tour, the lagoon of Bora Bora becomes the setting of your romantic getaway. For more than an hour, your dedicated guide will photograph you posing in front of the most amazing spots of the island. At the end, minimum 25 of the best shots will be yours! Great souvenirs to bring back home! As the day fades, Champagne will be served to you in coconut shells on board or during a last swim in the lagoon. 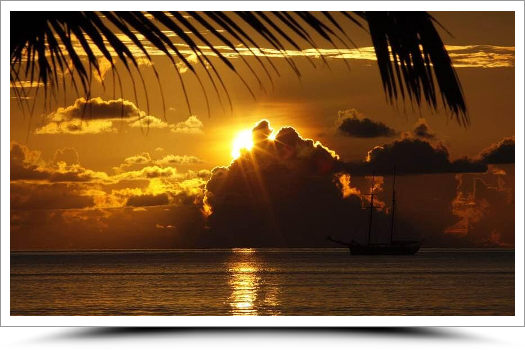 Time has come to experience the famous South Pacific sunset. Unforgettable! Return to your hotel with amazing memories. 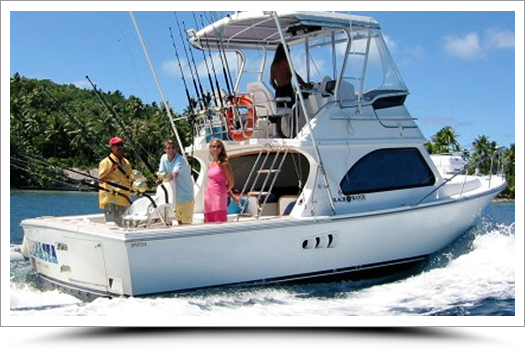 Experience a half-day fishing in the lagoon or outside the reef aboard a 17-feet Boston Whaler. You may catch kingfish, barracudas or grouper in the lagoon or thazars, mahi mahi or yellowfin tunas oceanside …In the morning or afternoon spend a good time and be sure that you will not come back empty-handed! The captain will take you to the best fishing spots in Bora Bora. 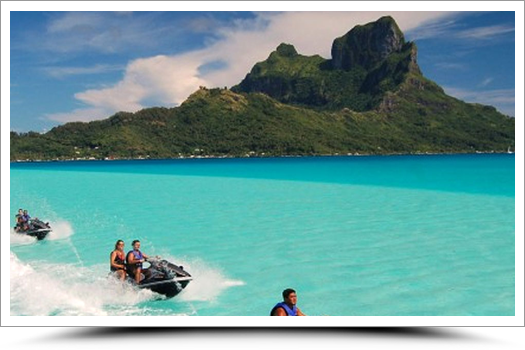 Go on an adventure around the Bora Bora lagoon on your own jet ski with your guide out in front. This is the perfect opportunity to take in all the lagoon’s blue hues and snap some incredible photos of the island and lagoon (waterproof compartment for cameras on the jet ski). And why not sample some tasty local fruit whilst taking a break on the beach? This circle island tour is an opportunity to really enjoy yourself while discovering the “most beautiful lagoon of the world”. Your first stop will be on a white sandy beach. Relax and admire the amazing view, while some fruits will be served to you. A second stop will be on a motu, small islet, for a coconut show. Your guide will explain how to climb the coconut tree and how the Polynesian people use this fruit. The views and experience are sure to become one of the best memories of your time in Bora Bora. If you’re no water baby but you want to explore Bora Bora’s submarine flora and fauna then this is perfect for you! 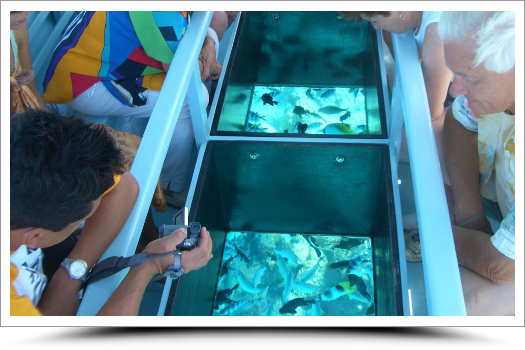 You can observe the coral gardens and plant life through the boat’s glass bottom and the multi-coloured fish attracted to the boat will come to take a look at you too! This trip is made all the better with its superb scenic surroundings and the lagoon’s unique setting which you can admire from the comfort of this covered pirogue. Perfect for the non snorkellers who can enjoy a magical and relaxing moment. Viewing is done through large glass windows. A roof provides protection from the sun and eliminates glare on the windows, so pictures and videos come out quite nicely. Glide over multicoloured exotic corals and fish in a comfortable boat and learn about the local fauna and flora. You will be fascinated by the beauties of the lagoon while a diver will attract the fish right under the window you are looking through. This tour will allow you to view some of the marvellous landscapes from the sea in their unique settings. A full day excursion walking through the Valley of kings to the “Ancestors’ Peak”. 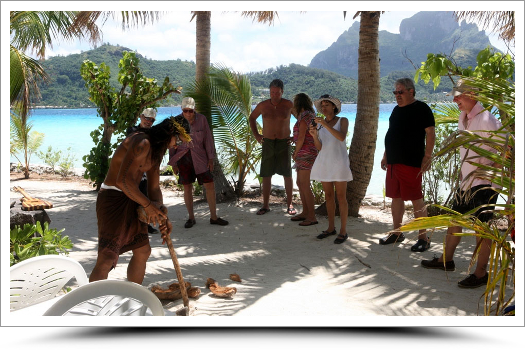 You will learn the virtues of medicinal plants as well as tales & legends of Bora Bora with your ethnobotanist guide. Discover island treasures hidden in the valley on your way to the top where you will enjoy a breathtaking view on Bora Bora turquoise lagoon.